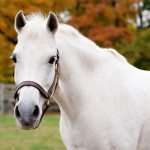 Description: Born in 2001, “Rosemell’s Kodak Moment”, aka Cody, is an adorable gray medium sized pony. Cody’s most notable trait is his missing left eye. Personality: Despite his disability, Cody is a very active member of our Troop family. He loves to teach his students to jump and he has fast become a Troop favorite. History: Prior to joining NCMT, Cody showed as a children’s pony hunter in the local “A” and “C” show circuits. He has a lovely way of moving across the ground, and always jumps with his knees tucked and his ears pricked forward.